Word on the street says the new Transformers movie, Dark of the Moon, is a huge disaster. Well, the same holds true of the video game from Electronic Arts. The publisher received a big opportunity to separate its iPhone and iPad adventure from Activision's disappointing handheld efforts, and it dropped the ball in every respect. 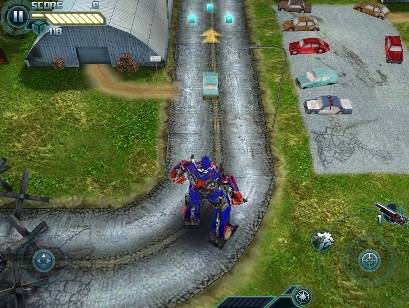 This top down third person shooter casts you as Optimus Prime and Bumblebee, as the two Autobots battle Decepticons all over the world, starting in Chernobyl and later taking the fight to the United States. We knew something was up during the tutorial, which features text bubbles instead of spoken dialogue. Electronic Arts didn't bother to hire voice actors, so you must wade through annoying pop-ups containing the boring narrative. That would be OK if the game was enjoyable, but it's woefully sub par. The virtual analog stick is too small, making it difficult to keep a thumb on it at all times. On top of that, it's also inaccurate and occasionally fails to work, forcing us to constantly slide in all directions to make Optimus/Bumblebee move. This is especially disappointing while in vehicle/stealth mode, where guiding the truck or sports car along a track is an exercise in frustration. In addition, combat is repetitive and not much fun. The ability to upgrade weapons like the Photon Burst Rifle, Null Ray and Fusion Cannon is a nice touch, but aiming these guns is a chore, thanks to the lame virtual stick. 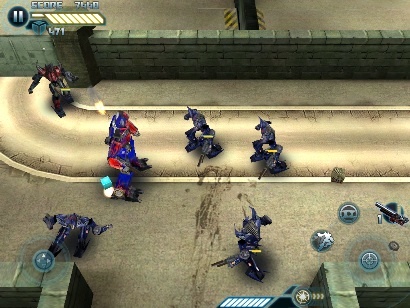 Past that, this is little more than your standard hack-and-slash affair, with waves of weak Decepticons and the occasional boss. The graphics, meanwhile, look PlayStation quality, as in 1995 PlayStation quality with anti-aliasing to smooth those rough edges. Attractive cut scene art notwithstanding, it's an ugly game. That said, you can toss Transformers: Dark of the Moon onto the pile (it's more of a mountain, really) of terrible movie based video games. It's one thing to see this from the likes of Activision, but with EA's success on the App Store, we expected better. Requirements: Compatible with iPhone, iPod touch, and iPad. Requires iOS 3.0 or later. Requirements: Compatible with iPad. Requires iOS 3.2 or later. What's Hot: Upgrading weapons, unlocking achievements. What's Not: Below average analog stick, disappointing story, no voice acting or multiplayer, repetitive combat.